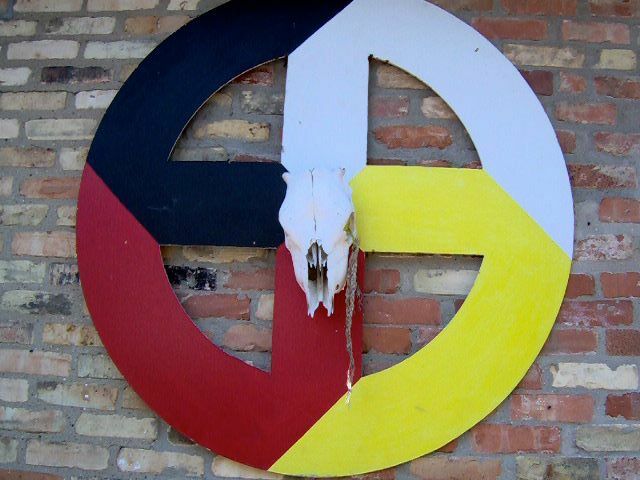 The Grand Valley American Indian Lodge invites the community to the 57th Traditional Pow Wow. Whether it is your first time at a pow wow or your tenth, you will enjoy the excitement, the color, the dancing, drumming, crafts and food! This Pow Wow is something to experience. Whether it is your first time at a pow wow or your tenth, you will enjoy the excitement, the color, the dancing, drumming, crafts and food! This year the event takes place at Riverside Park in Grand Rapids on Saturday, September 8 and Sunday September 9, 2018. We hope you look at the weekend as if it is one big family reunion and you all have been invited. You will see different tribes represented.The three prominent tribes of this area, Odawa (Ottawa), Ojibway (Chippewa) and Pottawatomi. You will also see Navaho, Cherokee, Lakota, Apache and others. Participants travel from all over the state of Michigan and Indiana, Ohio, Wisconsin and Canada. Dancers, drummers and vendors start coming into the park on Friday to set up camp and booths in order to be ready for the events starting on Saturday. Saturday, the craft booths open for business at 10 a.m. At 1 p.m. the dancing starts. The Grand Entry is the official beginning of the pow wow. This is where our Eagle Staffs and Flags carried by our veterans, lead our dancers into the circle. Our M.C. will tell you what is going on and how you should conduct yourselves. Hats off for Men, standing to honor the entrance of participants and usually no pictures at his time. There will be an invocation (prayer) for everyone to give thanks for our ability to share our traditions with you and blessings for a wonderful weekend. A Veterans song is sung to honor all veterans in the dance circle and in the visiting crowd. You will be given the opportunity to shake the hands of these honored people and thank them for their service. Then we have a welcome song and invite everyone who wants to come into the circle and dance. Please don't come into our circle if you have been drinking or doing drugs. And if you are dancing for the first time please respect our regular dancers. Do not just hop around and be funny, watch the other dancers and try to emulate the dances that interest you. Ask questions...that is how you learn. Any time our M.C. announces an Inter Tribal you may come in and dance. We even have what we call "spot dances". This is an inter tribal where you can dance and when the drums stop, you stand in place and our Arena Director picks a spot where that person wins some cash. There are several styles of dance where you will watch the dancers do their finest moves including Men'ss Traditional, Men's Fancy, Men's Grass, Women's Traditional, Fancy Shawl, Jingle and all the children doing their style. As we make our way through the afternoon we come to 4 p.m. At that time the dancing stops and one of our drums and some dancers will go across to the Veterans Facility for a presentation for those who can not make it to the pow wow. Then it is our dinner break and dancing resumes at 6:30. During this break, the craft and food booths remain open for your shopping and eating pleasure. You can get fry bread, Indian tacos, buffalo burgers, strawberry shortcake and many other delicious items. The craft booths have everything you could imagine, from silver jewlery to childrens items and everything in between. Our staffs and flags will be removed before sunset. Dancing stops but the fun doesn't. We have an auction at 9 p.m. to help offset the cost of putting on this great event. Some great items have been donated for our auction. Please stay and bid on items that have caught your eye. They will be set out for inspection before the auction starts. Every penny goes back into the Pow Wow. And we have a blast. Be prepared to stay for awhile. It might get chilly...we have a few blankets to auction! Sunday we start over with craft booths opening at 10 a.m. and the Grand Entry is at noon. We will follow Saturday mornings schedule. Our closing ceremonies will be at 4 p.m. with a giveaway for all who remain. Our M.C. will call up people to receive a gift from the pow wow committee. So come and enjoy a weekend of Native American culture at its finest. It's free entry, free parking and a fun family friendly event. Please leave your pets at home. We have a no dog ordinance for the weekend due to a previous dog bite incident. Our fur babies don't belong in these crowds. And please do not leave them in your car! Hope to see you all there! You will have a fantastic memory that will bring you back year after year.